Support a thriving, just and sustainable future by creating a fundraiser to help raise money for Pachamama Alliance. 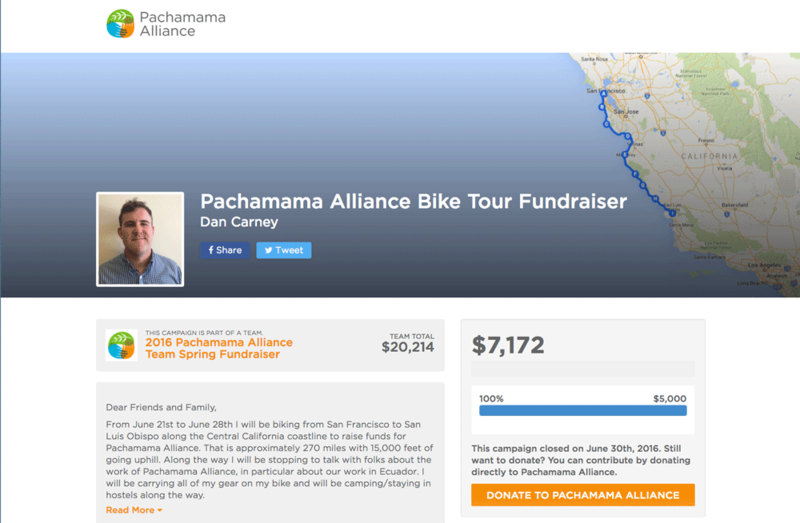 Join dozens of other Pachamama Alliance supporters who have run campaigns to support this work and spread awareness by inviting their friends and family to donate to Pachamama Alliance. Together, we can raise the funds needed to protect the Sacred Headwaters of the Amazon and bring forth an environmentally sustainable, spiritually fulfilling, and socially just future. It's easy to create your campaign. Create your story and goal. What is your personal connection to Pachamama Alliance that you will use to invite your friends to donate? How much will you commit to raising? $100? $500? $1,000? Find a goal that feels attainable, but still a stretch. Fill out a form to enter your fundraising goal, personal information, and your story. It only takes a few minutes! Invite your friends to give. Reach out to your friends and family and invite them to make a donation to your campaign by your campaign end date. Make Your Campaign Fun and Creative! Wrap your campaign in a goal or topic and gain more support from friends and family. Ask your friends and family to donate to your campaign instead of giving you birthday, wedding or shower gifts. Tell your friends and family that you'll do a New Year's resolution if you hit your goal by December 31! Commit to a marathon or a bikeride and invite your friends and family to donate for your endeavor. Commit to reading books and invite your friends and family to donate for your endeavor. Donate your time for skill-sharing sessions with others and ask them to donate to your campaign in return. Pledge 1 hour of volunteering with an organization or cause for each $100 that is donated to your campaign. 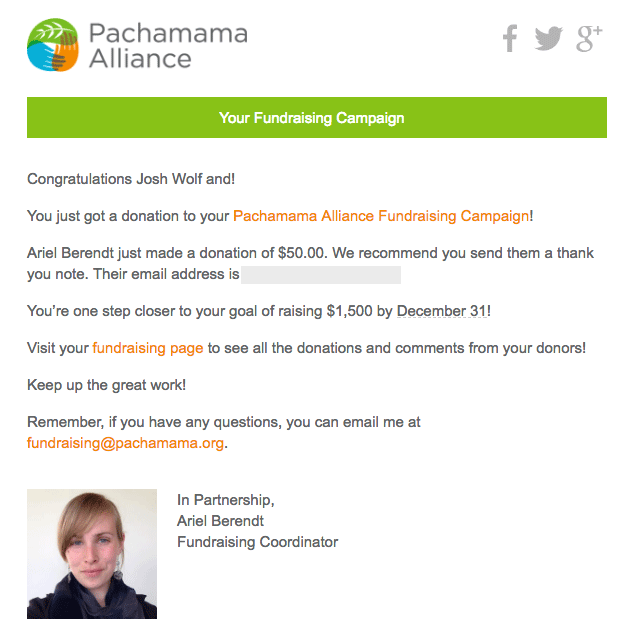 After you sign up, the Pachamama Alliance team will set up your fundraising page. Once it is in place, we will email you a link to your page and then you can begin inviting your friends and family to donate! How much should my goal be? Everyone has a goal that feels easy and a goal that feels impossible. Somewhere in between is your stretch zone - the goal that you know you can achieve, but it will require you pushing yourself a bit. This is where we encourage you to set your goal. Please note that you can’t change your goal once you’ve started collecting donations. How do I know who donated to my campaign? Each time someone donates, you will receive an email notification indicating who donated and how much they donated. What does the money I raise fund? The money you raise for Pachamama Alliance will help fund our work with our indigenous partners in the Amazon rainforest and the delivery of our educational programs around the world. You can visit pachamama.org to learn more about this work and you can view our financials to learn about our income and expenses. Here is an example of how your page will look. How do I update my page? If you need to update any information, please email fundraising@pachamama.org. We hope you are able to reach your goal by the end of your campaign. But in case you don’t, not to worry, all donations are final and will go to Pachamama Alliance whether you meet your goal or not. This is not the type of fundraising campaign where funds are only collected if you reach your goal. Will my donors get an acknowledgement? 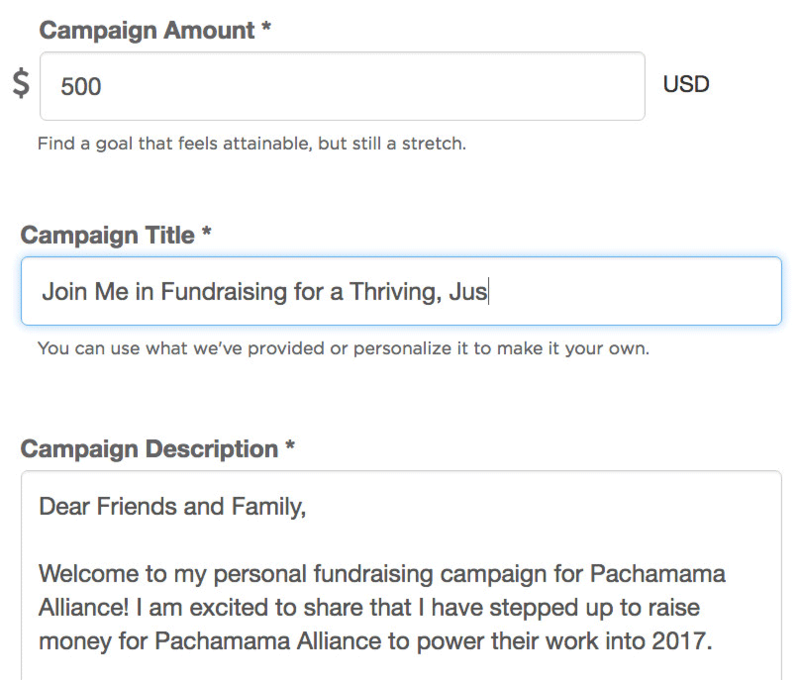 Your donors will receive a thank you email from Pachamama Alliance for their donation, but it will not reference your specific campaign. We recommend that you send each donor a personal thank you note.